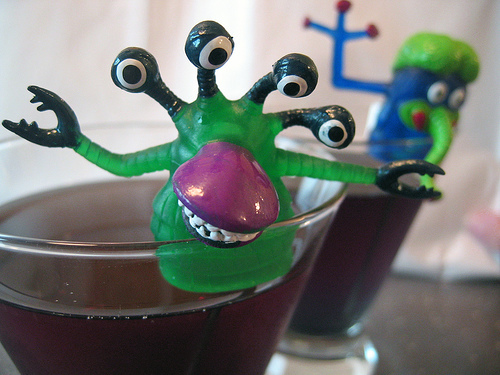 Halloween is my excuse to try new recipes, gussy up the house and serve multi-colored, nasty looking drinks. Every year I throw a big Halloween bash, and make it an all-family event. Adults and children dress in costumes, then play spooky tricks and eat Halloween treats. One of my goals for this year's party is to out the lights: using only string lights, candles, light-up skeletons, pumpkins and glowing cauldrons to give visibility to wondering guests. I bought a lot of eyeball lights this year to adorn the basement, where all the kids cut loose and have uninterrupted fun. My favorite decorated room is the dining room, where purple strands of lights come from each corner of the ceiling and wrap around a central chandelier. It looks like a huge spiderweb, and offers plenty of eerie ambience for guests. House decor aside, meet my latest drink: the Purple People Eater. Naming the drinks is almost as fun as testing them! This started as a blue drink until my neighbor mentioned how cool would it be if you turned it purple? And since I was already in love with all the purple lighting, I was easily swayed to concoct a purple drink. Thus came both the splash of cranberry and the fun new name. At first I had named it 'Eerie Blue Tini' until we changed the color to purple and it evolved---in Halloween style---to the Purple People Eater. Per drink: 3/4 parts vodka, 1/4 part cranberry juice, and splash of blue curacao. Raspberry Simple Syrup: bring 1 cup sugar and 1 1/2 cups water to simmer over stove, as soon as sugar is dissolved, add 1 cup fresh or frozen raspberries. Simmer one more minute, then off heat and let cool to room temperature. Strain berries and pour syrup into container. Store at room temperature in closed container. Makes good Italian Sodas too!